Fitbit Alta v Fitbit Flex 2: Which is the best fitness tracker for you? Fitbit may be slowly progressing into smartwatch territory, but its merry band of fitness trackers is still where the company makes its hay. With an increasing family for you to choose from, though, and the recently released Alta HR now in contention, it can be difficult to decide which is the right device for you to strap onto your wrist. 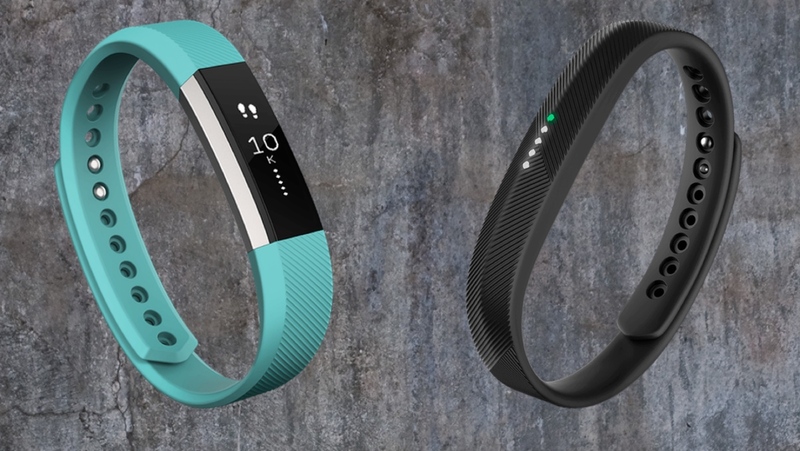 Two popular options for those looking to pick up their first tracker are the Fitbit Flex 2 and Fitbit Alta, but both offer different features and designs for you to take advantage of. Which is right for you? Read on for our comparison of the two trackers. Unlike the Fitbit Blaze or Charge 2, neither of these trackers takes up an enormous amount of wrist real estate. Both also do an impressive job of remaining unobtrusive thanks to the curved design. But while remaining relatively skinny at 15mm, the Alta does protrude more due to the major design difference between the two: the screen. It looks every bit like your typical fitness tracker, with a small 128 x 36, 1.4-inch OLED screen sitting in the middle of a quick-release band. The Flex 2, on the other hand, is even less noticeable. It's also slimmer than its predecessor thanks to the tracking module being 30% smaller, and an ideal fit for those looking to camouflage tracking exploits through a pendant or bangle. Alta bands come in three sizes to fit wrists of 14–17 cm, 17–20.6 cm and 20.6–23.6 cm, while switching out is really simple. The personality isn't limited to the Alta, though, with the Flex 2 also receiving plenty of customisation options. One thing that gives the Flex 2 the leg-up in this department is its waterproof design, allowing you to wear it around the clock. The Alta doesn't offer the same smarts, unfortunately, meaning you'll be popping it off to shower or swim. Overall, these are two minimalist designs that pair nicely with rugged and smart attire. And thanks to their customisation, keeping the tracking fresh is always an option. With the major design difference coming through the screen, you'll interact with each device in very different ways. If you're rocking the Alta on your wrist, you'll be free to check the time or notifications with a flick of the wrist. With this also comes the option to customise the face with five vertical or five horizontal clock options. To keep an eye on your progress, you'll have to tap on the screen and deal with some minor inconsistency. Notifications on the Flex 2 are an entirely different animal, and you'll have to get used to LEDs if you hope to have any idea when you're receiving a text and when you're being reminded to move. Annoyingly, the five lights can't be personalised to your liking, meaning you'll have to deal with Fitbit's default pattern to differentiate between notifications. There's also no support for third-party. To track your progress, you'll have to take note of how many white lights are illuminated on the band. The more white lights that illuminate on the band, the closer you are to your target. It sounds quite straightforward, but things get a little messy when you feel a vibrating buzz at the wrist and see a colour flash up to signal that someone is trying to get in touch. The bottom line: the Alta's screen will have you looking at your phone a little less, but neither is giving you fully fledged support. What you'll get from both of these devices is pretty basic activity tracking. To be clear: neither is going to replace a running smartwatch. Both are capable of tracking steps, distance, calories burned, active minutes, hourly activity and sleep through the SmartTrack feature. This means your device will know when you're walking, running, on the bike indoor or outdoor, taking on an aerobic workout or playing a sport like basketball, soccer or tennis. But while they may appear to offer the same on paper, we found the Flex 2 to be slightly more reliable in tracking through testing. While it was able to keep up with the likes of the Apple Watch Series 2 without any issues, the Alta was found to be more sensitive when it came to counting steps. Sleep tracking, while basic and not entirely on the mark on either device, is also a less comfortable experience on the Alta due to the screen light popping up. When it comes to swimming, the Flex 2 may only offer basic tracking, but it's the only device in the Fitbit range to allow this. It can be worn up to 50m (including in saltwater) while keeping tabs on duration and four strokes: freestyle, breaststroke, backstroke and butterfly. Unfortunately, people looking for more advanced metrics will be forced to look past this duo — there's no GPS, optical heart monitor or stair climbing here. In terms of battery life, the five-day juice of the Flex 2 is surprisingly mediocre. Of course, this is all relative to how you're using the tracker, but around seven or more days would be solid for a device that doesn't rely on screen notifications. Speaking of which, around a week is exactly what the Alta delivered during our testing making it the longer lasting Fitbit of the two. Yes, the all-important price point. While fancy features and shiny lights are all well and good, this can often be what forces you to choose between devices. In the case of these two trackers, there's also a relatively big gap considering both are mid range. While the Flex 2 will set you back $99.95, the screen-packing Alta will leave a $129.95 hole in your back pocket. To Flex or to Alta, that's the predicament you face. Both devices do a good job of accomplishing what they set out, and that's providing you with an introduction into the fitness tracking game. Sure, there are other devices out there that can do more if you're willing to shell out the cash, but basic stats are here in a comfortable, stylish and customisable package. For swimmers or people looking for the most discreet option available, the Flex is the clear choice here. But for those looking for slightly more from the notifications and battery department, and a device that fits the more traditional fitness tracker mould, the Alta is worth the extra money.